Once picture album and one description for all chassis types. These rolling chassis are platforms to build cars on and a standard way for me to build them. I read a lot about people having problems with terrain seams. Usually they’re caused by spring/dampers settings that are too high. Especially strong dampers have a negative effect, also on wheel survivability. You’ll notice I haven’t used the grey TR2-L wheels. The reasons is simple: they have less suspension travel which is a big problem while driving through terrain. I rather stack the M1 wheels like I’ve done with the C, D and E chassis. All chassis are powered by Juno jet engines placed in the front for a better mass distribution. This gives a better handling. Lovers of sports cars like Porsches might not agree but there are multiple reasons 99% of all cars have their engine and running gear in the front. 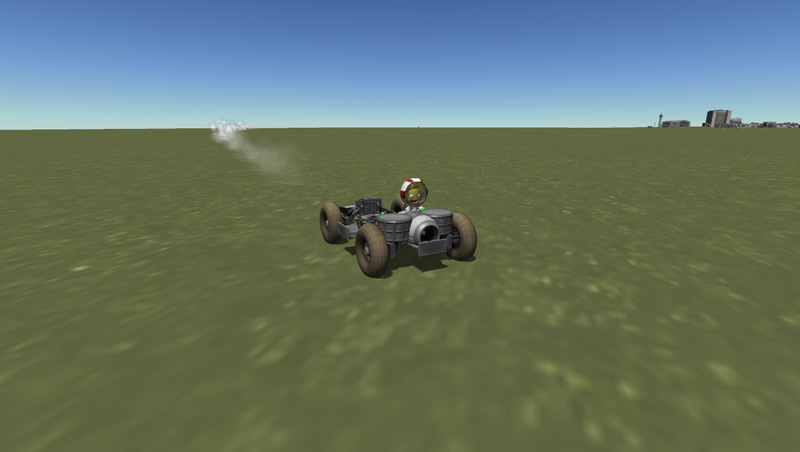 Spring, damper and friction settings are always a compromise, the ideal car doesn’t exist in real life, neither in KSP. If you use a chassis to build your own bodywork, be patient and test a lot, the handling will change with every part you add. All chassis use the Boost Flap, which is my invention. The Boost Flap is coupled with the brakes and action group 2, it interrupts the thrust from the jet engine(s) to provide fast braking while keeping the jet engines running at full speed. Great if you’re in a hurry or while racing, or when you need to reverse. Disadvantage is that the jets continue to consume fuel but you can charge your batteries. All types fit in a MK3 cargo bay. Small chassis for two kerbals with a single Juno. Good for city cars. The Boost Flap is placed horizontally, activating it pushes the rear down at high speed. A standard, mid sized chassis for four kerbals using two Juno’s. Good for standard family cars like sedans or hatchbacks. A somewhat wider mid sized chassis for four kerbals using 4 juno’s and two extra fuel tanks near the rear axle. It has 8 wheels to cope with the high power and increased mass. The Boost Flaps are configured like an X, this provides stability at high speed and does two things: it helps pushing the rear down and centering while braking. If you want more oversteer, change it to a horizontal type. This chassis is great for racing cars. This much longer chassis also has 4 Juno’s but even more fuel and an extra: fuel cells. The Boost Flaps are set up vertically, it doesn’t provide downforce while braking but helps reducing oversteer. Great for limo’s, executive cars. Same as the type D but with the Boost Flaps placed directly behind the engines and with a flat floor in the rear. Applications: stationwagon, hearse.